1 Small Gift Bag 7 7/8" x 9 3/4" x 4 1/2" - Metallic gold diamond pattern on matte gold foil with burgundy cuff and horse accents. It's made of heavy paper, has cardboard bottom insert and metallic To/From tag threaded onto the gold rope handle. 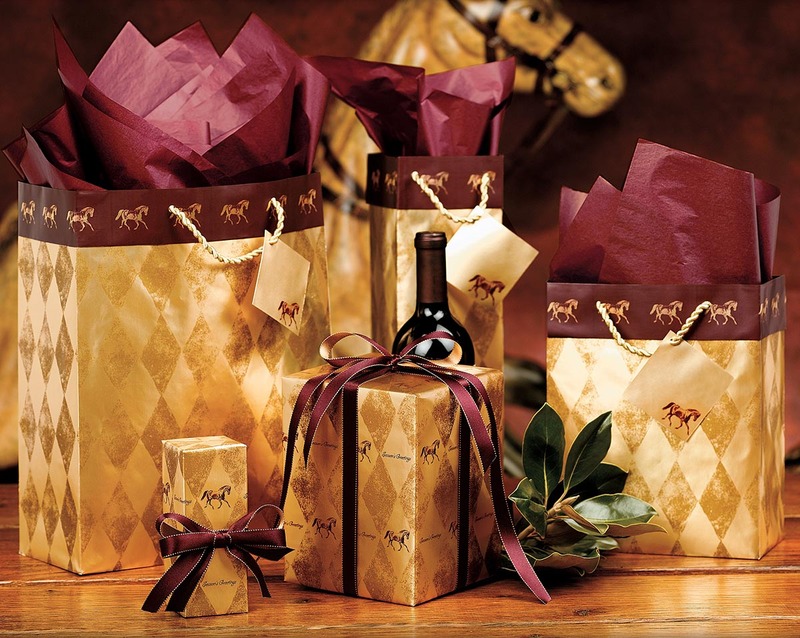 1 Wine Gift Bag 4 1/4" x 14 1/4" x 4" - Metallic gold diamond pattern on matte gold foil with burgundy cuff and horse accents. It's made of heavy paper, has cardboard bottom insert and metallic To/From tag threaded onto the gold rope handle. 1 Medium Gift Bag 14" x 11" x 5" - Metallic gold diamond pattern on matte gold foil with burgundy cuff and horse accents. It's made of heavy paper, has cardboard bottom insert and metallic To/From tag threaded onto the gold rope handle. 2 Burgundy Tissue Paper Packs 5 sheets of 26" x 20" each. 1 Roll Harlequin Horses Wrapping Paper 24" x 7 1/2' - gold diamond pattern on matte gold foil.